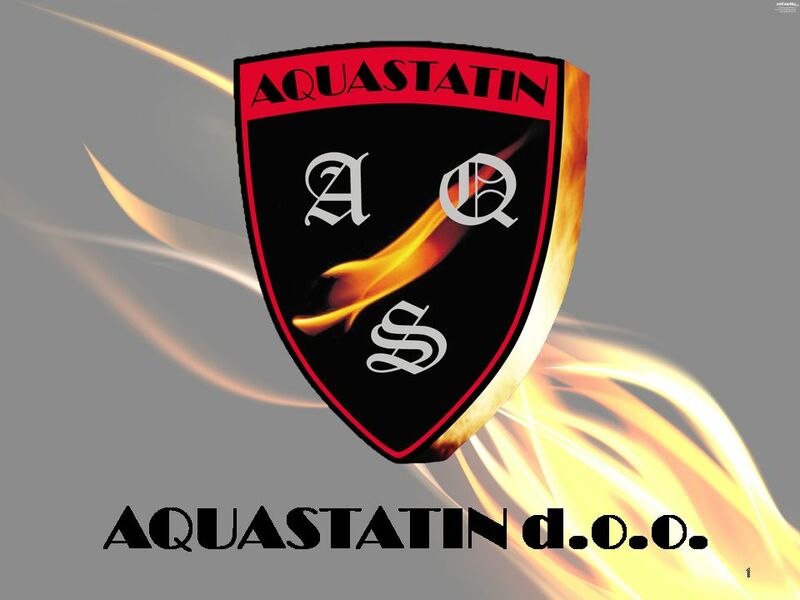 2 AQUASTATIN Ltd. is engaged in research, development, production and application of two groups of products: AQUASTSTIN AF 20 AQUASTSTIN AF 20 – a product. 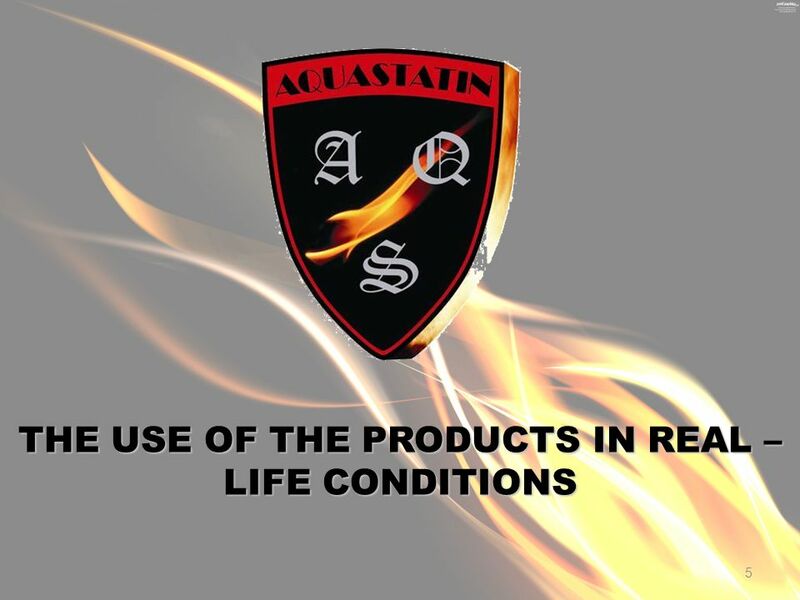 2 2 AQUASTATIN Ltd. is engaged in research, development, production and application of two groups of products: AQUASTSTIN AF 20 AQUASTSTIN AF 20 – a product for ecological and material accidents prevention caused by self – ignition and fire. 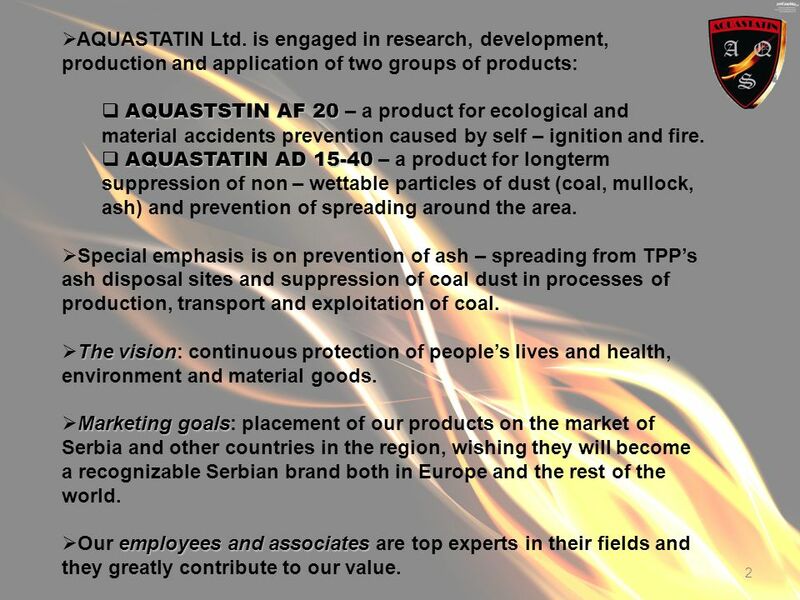 AQUASTATIN AD 15-40 AQUASTATIN AD 15-40 – a product for longterm suppression of non – wettable particles of dust (coal, mullock, ash) and prevention of spreading around the area. 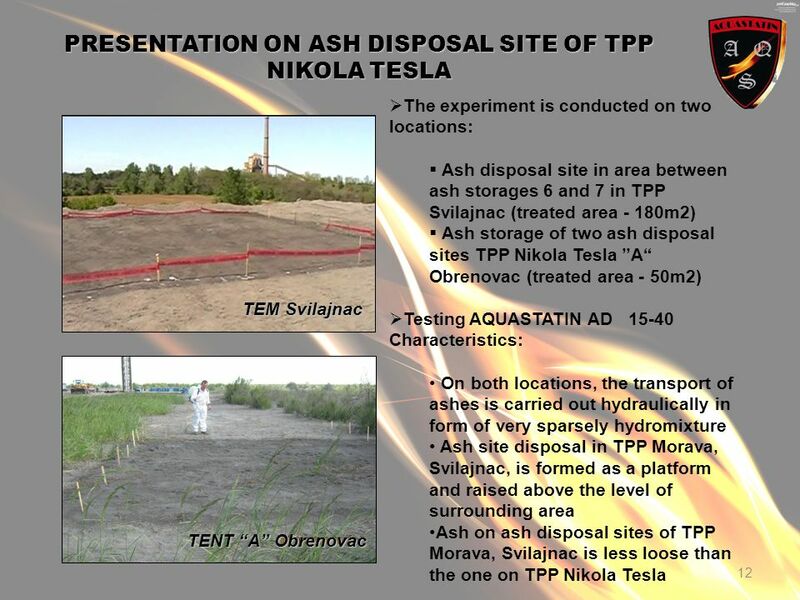 Special emphasis is on prevention of ash – spreading from TPPs ash disposal sites and suppression of coal dust in processes of production, transport and exploitation of coal. 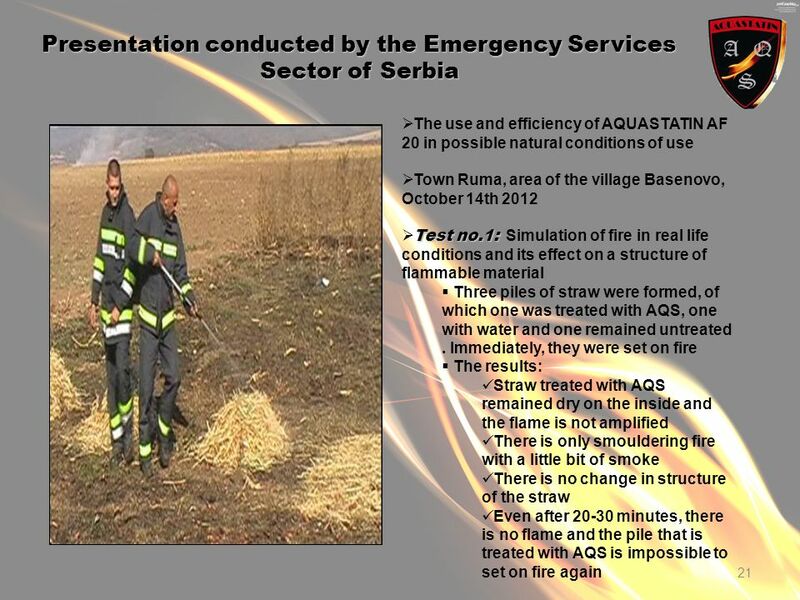 The vision The vision: continuous protection of peoples lives and health, environment and material goods. 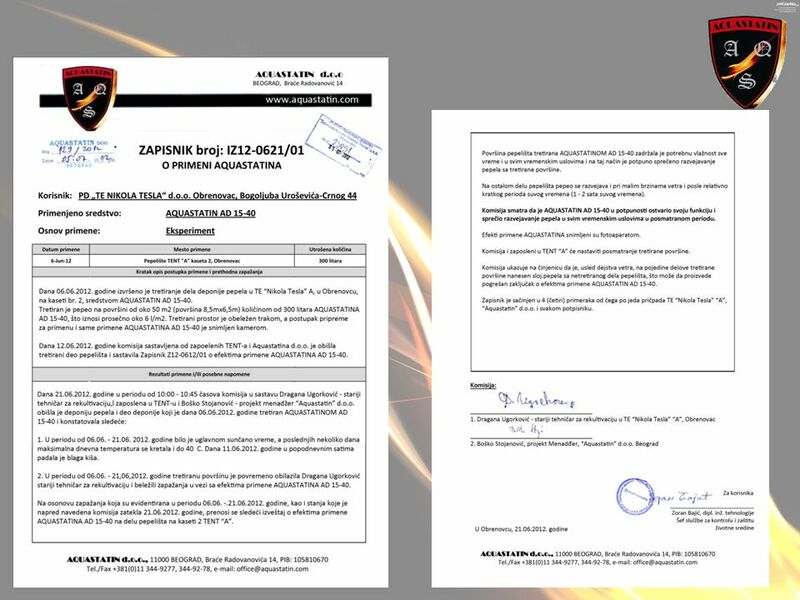 Marketing goals Marketing goals: placement of our products on the market of Serbia and other countries in the region, wishing they will become a recognizable Serbian brand both in Europe and the rest of the world. employees and associates Our employees and associates are top experts in their fields and they greatly contribute to our value. 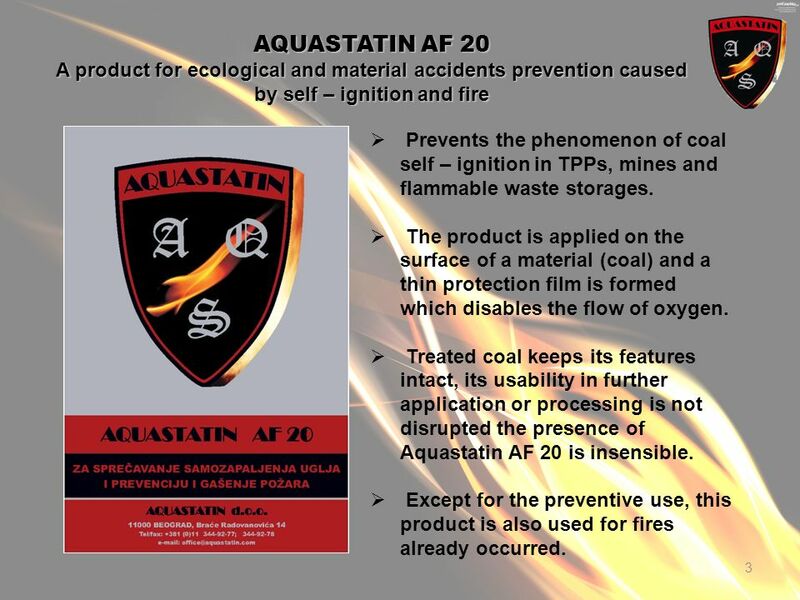 3 3 AQUASTATIN AF 20 A product for ecological and material accidents prevention caused by self – ignition and fire Prevents the phenomenon of coal self – ignition in TPPs, mines and flammable waste storages. 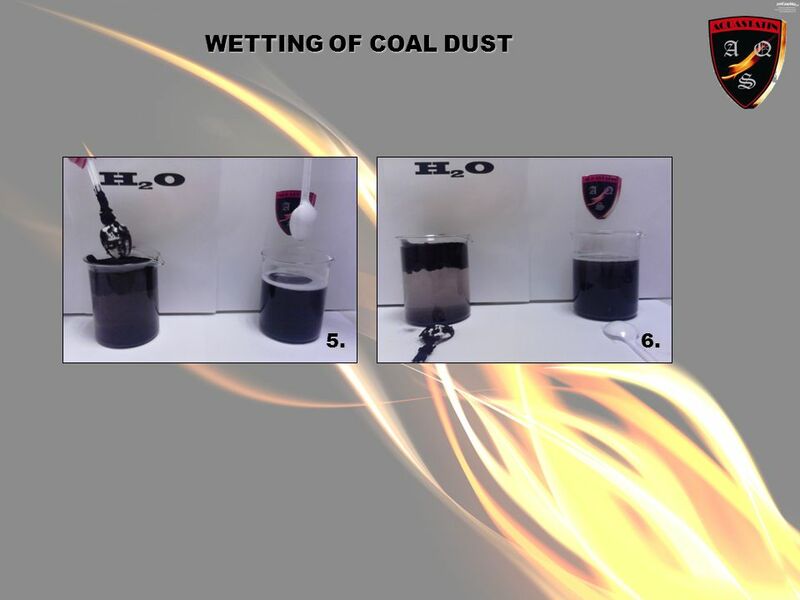 The product is applied on the surface of a material (coal) and a thin protection film is formed which disables the flow of oxygen. 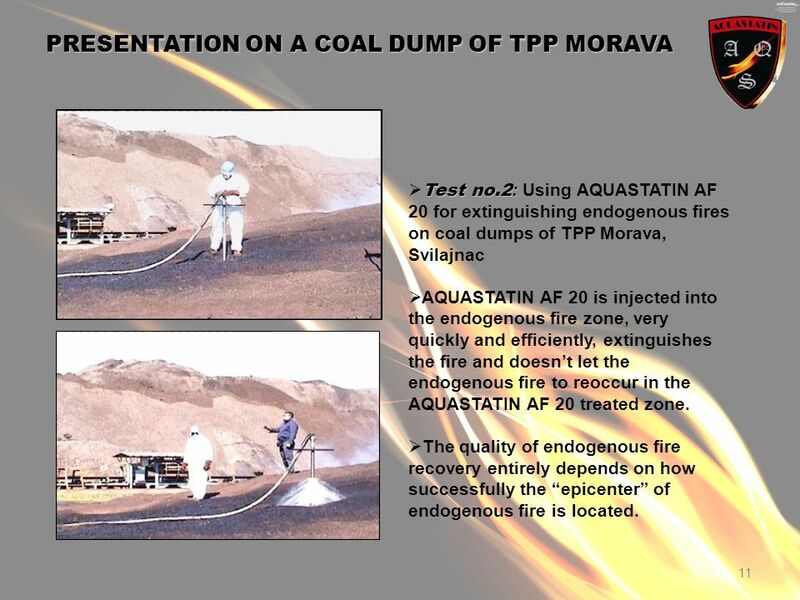 Treated coal keeps its features intact, its usability in further application or processing is not disrupted the presence of Aquastatin AF 20 is insensible. 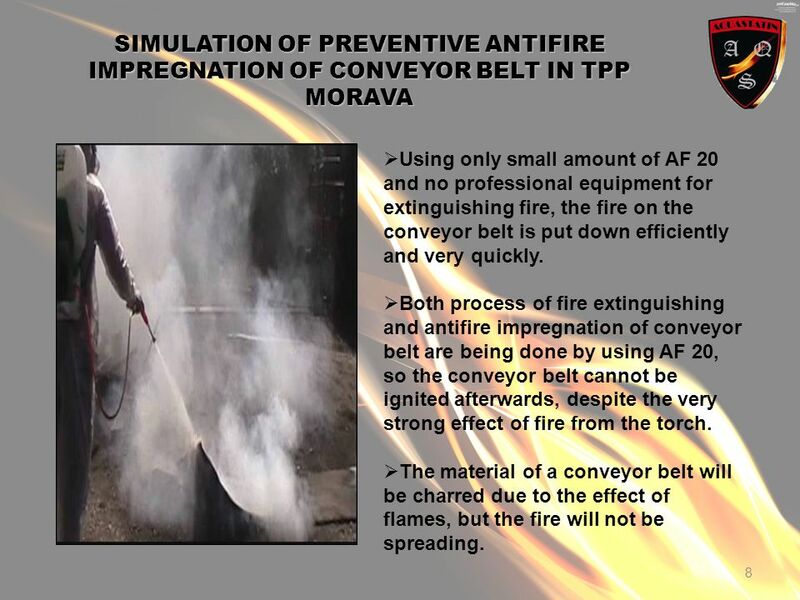 Except for the preventive use, this product is also used for fires already occurred. 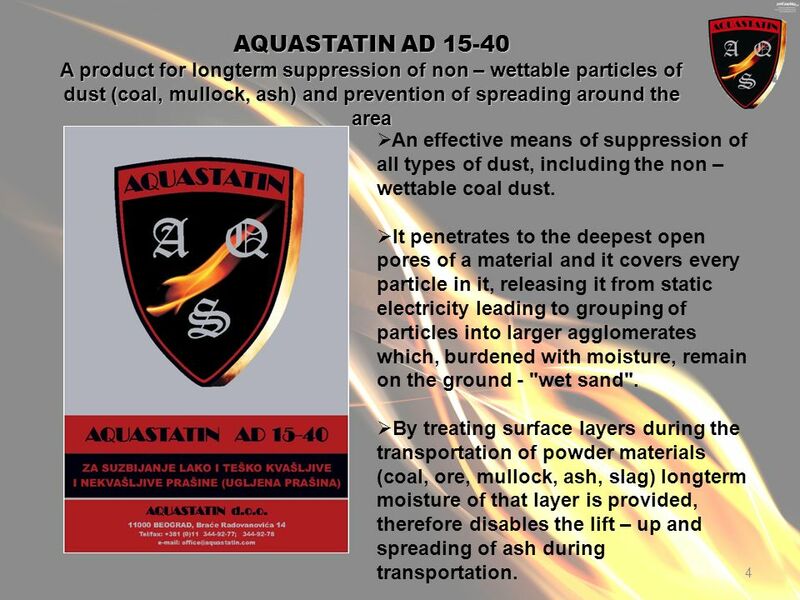 4 4 AQUASTATIN AD 15-40 A product for longterm suppression of non – wettable particles of dust (coal, mullock, ash) and prevention of spreading around the area An effective means of suppression of all types of dust, including the non – wettable coal dust. 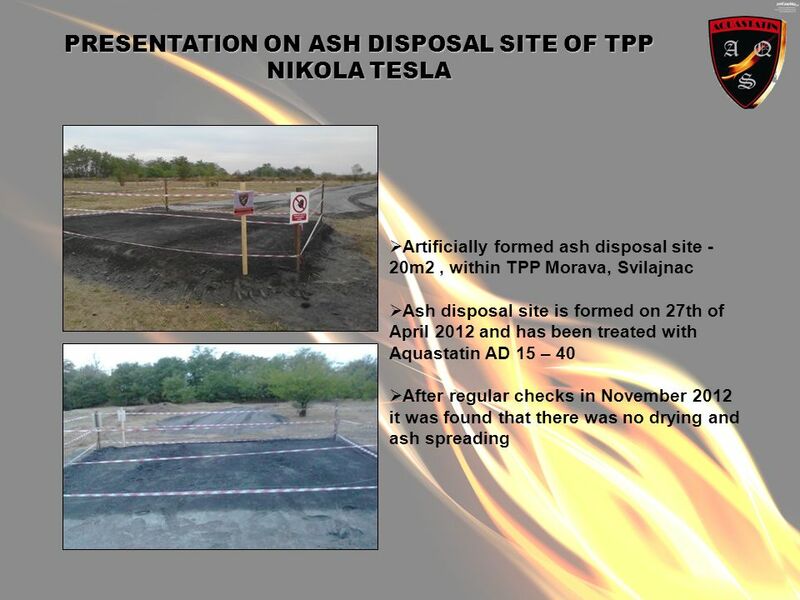 It penetrates to the deepest open pores of a material and it covers every particle in it, releasing it from static electricity leading to grouping of particles into larger agglomerates which, burdened with moisture, remain on the ground - "wet sand". 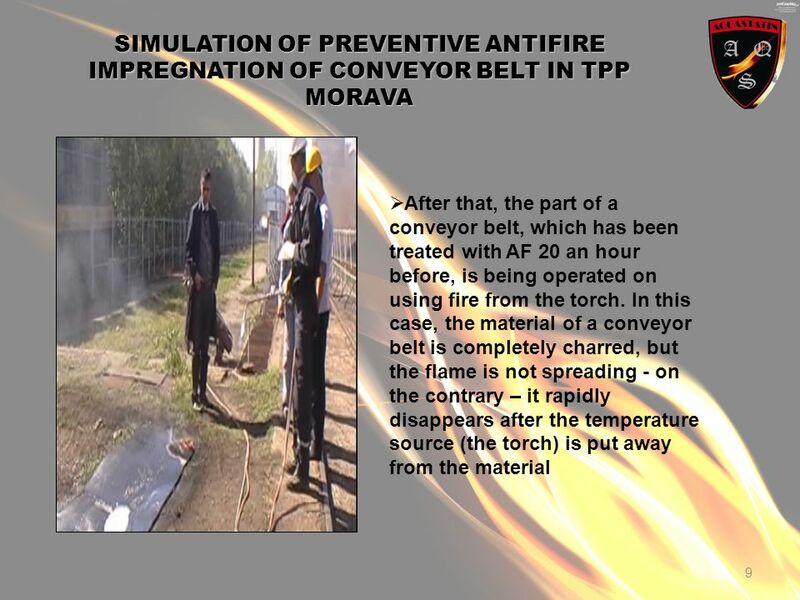 By treating surface layers during the transportation of powder materials (coal, ore, mullock, ash, slag) longterm moisture of that layer is provided, therefore disables the lift – up and spreading of ash during transportation. 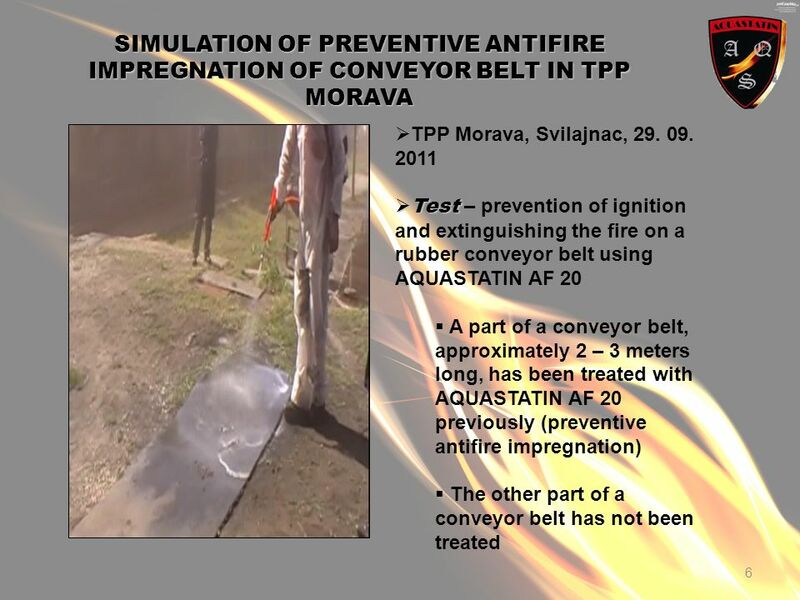 11 11 PRESENTATION ON A COAL DUMP OF TPP MORAVA Test no.2 : Test no.2 : Using AQUASTATIN AF 20 for extinguishing endogenous fires on coal dumps of TPP Morava, Svilajnac AQUASTATIN AF 20 is injected into the endogenous fire zone, very quickly and efficiently, extinguishes the fire and doesnt let the endogenous fire to reoccur in the AQUASTATIN AF 20 treated zone. 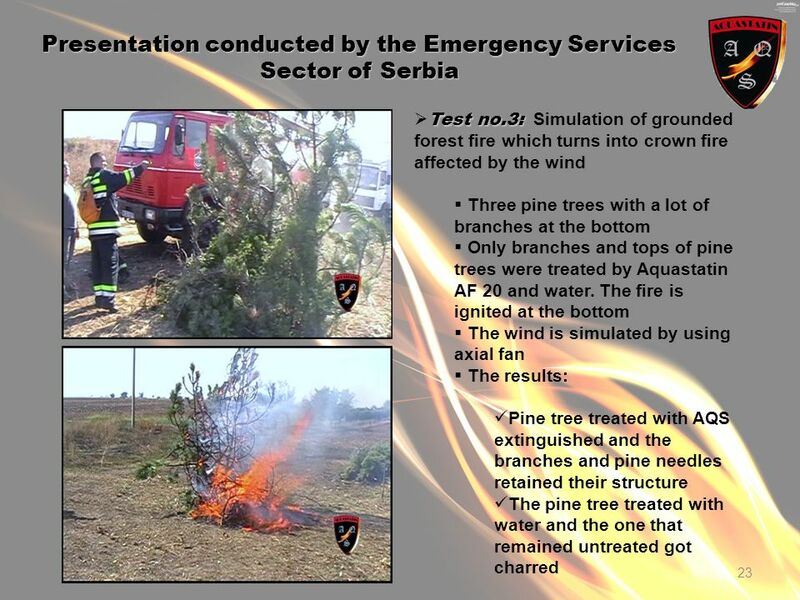 The quality of endogenous fire recovery entirely depends on how successfully the epicenter of endogenous fire is located. 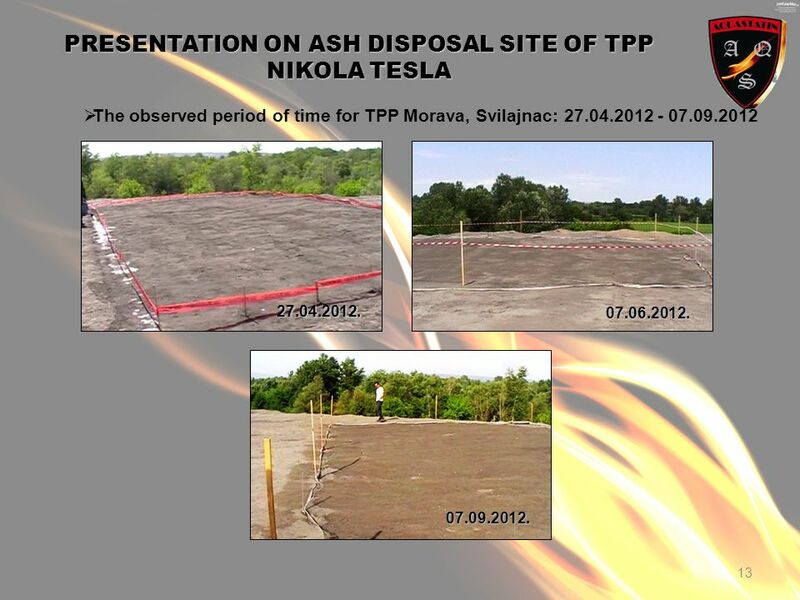 13 13 PRESENTATION ON ASH DISPOSAL SITE OF TPP NIKOLA TESLA The observed period of time for TPP Morava, Svilajnac: 27.04.2012 - 07.09.2012 07.06.2012. 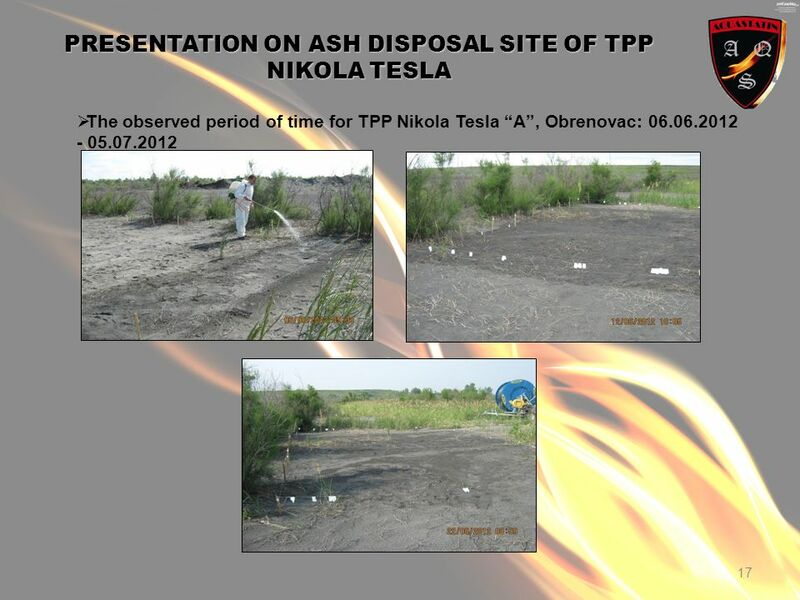 07.09.2012. 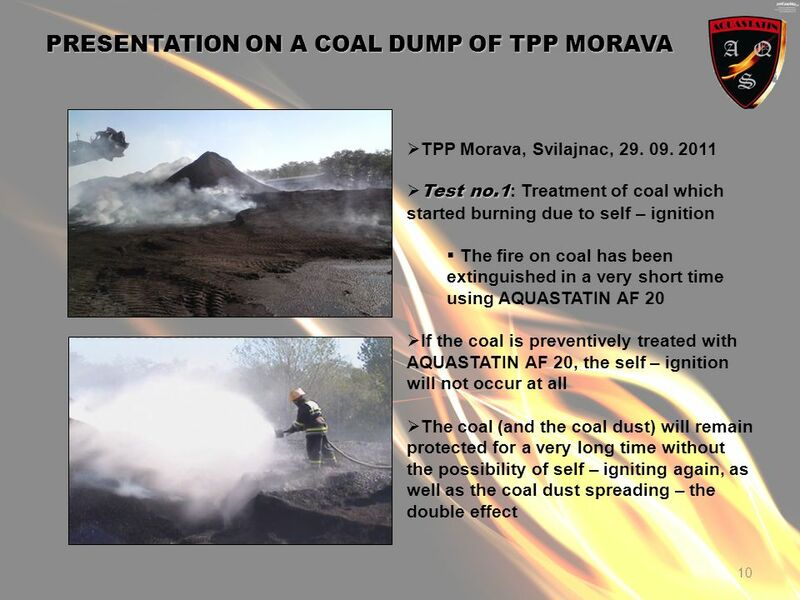 27.04.2012. 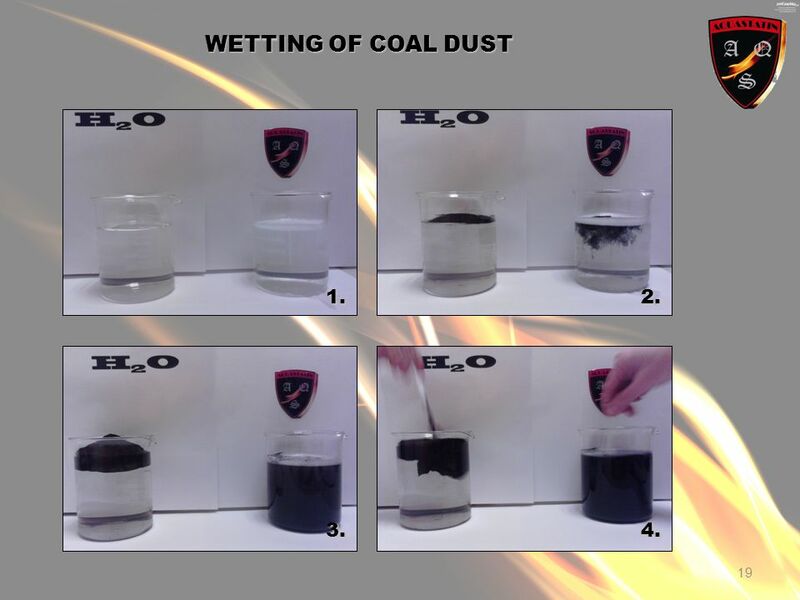 19 19 WETTING OF COAL DUST 1.2. 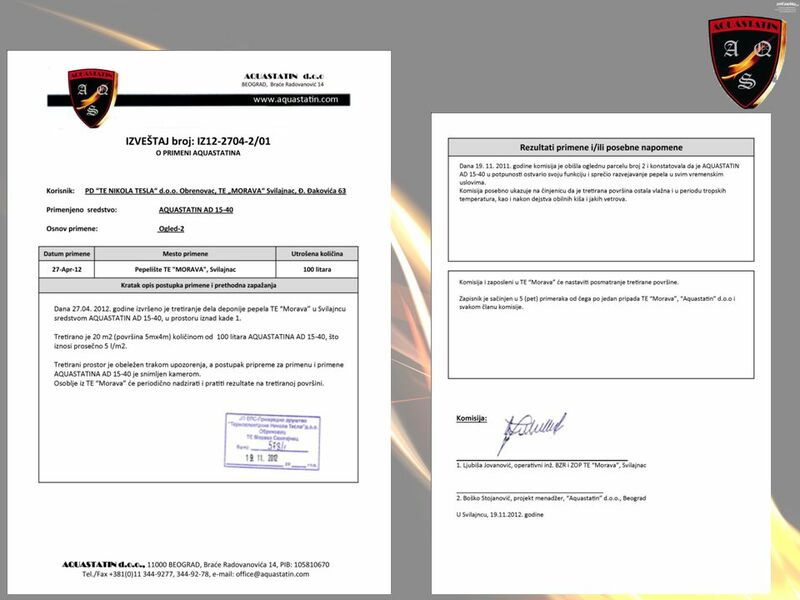 3.4. 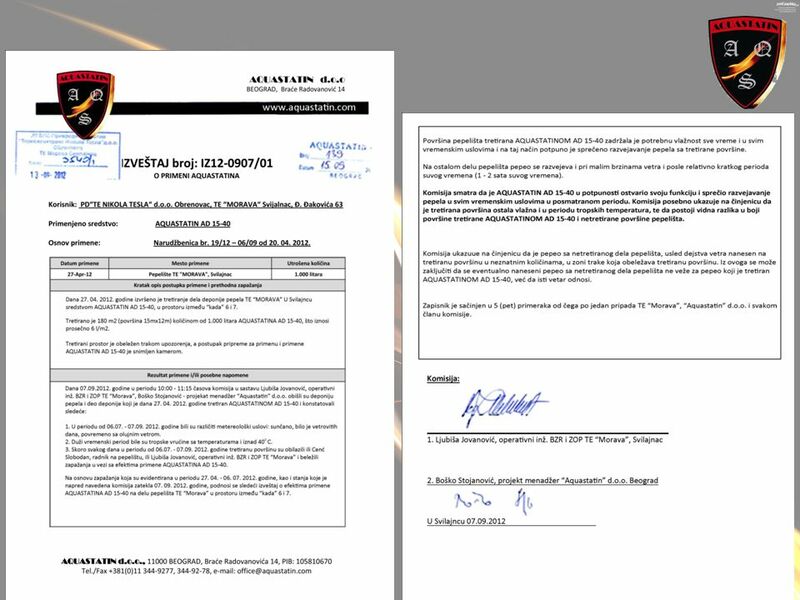 Download ppt "2 AQUASTATIN Ltd. is engaged in research, development, production and application of two groups of products: AQUASTSTIN AF 20 AQUASTSTIN AF 20 – a product." 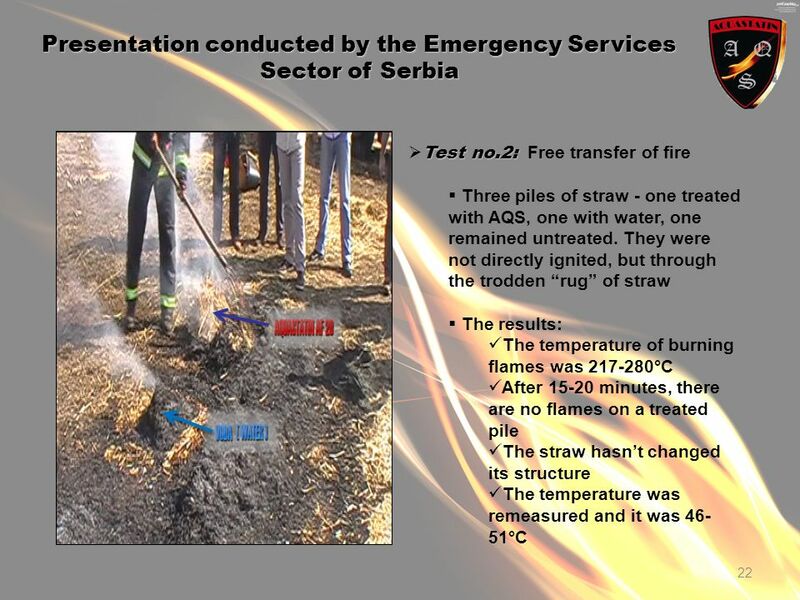 Weathering and Soil Test Review. 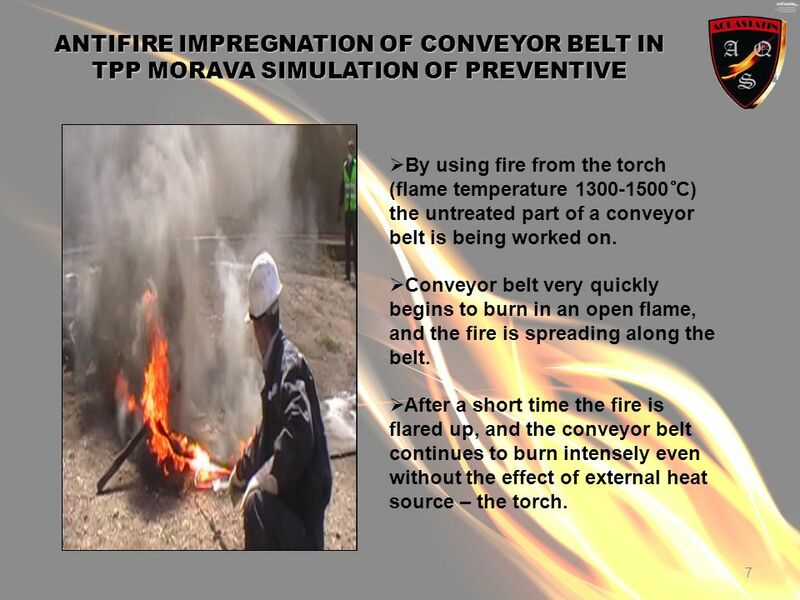 Objective Upon the successful completion of this module, participants will be able to describe the chemical and physical differences between pure gasoline. ES_21_2 Spain, Canary Islands, Gran Canaria, Las Mesas (San Mateo) 2004 W.P Examples of prescribed burning and its effects UL-UFF. 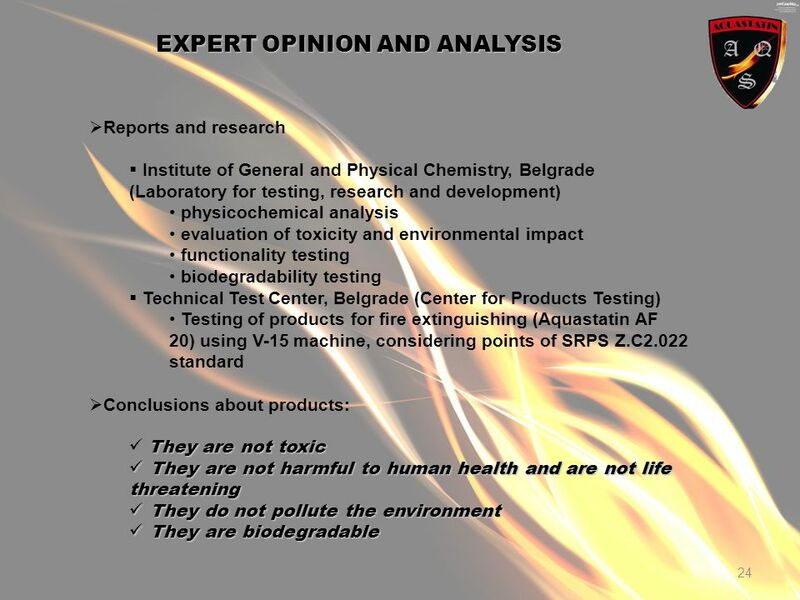 Air Pollution Control « Air Pollution Control Ordinance » ( Chapter 311 ) The Air Pollution Control Ordinance(APCO) is the main legislative framework.